A considerate and good guest will always be invited back! The invitation has just arrived in the mail. What do you do next? Invitation photo by Reva Paul – All Rights Reserved. (1) When invited as a guest to an occasion. It is rude to ask one’s host/hostess if they may bring along another guest. Unless included in the original invitation, do not ask your host if you may bring your children, pets, or another guest. When someone has extended an invitation to you never, ask your host to change the venue. The correct manner in which to handle an invitation when one has a visiting house guest is to inform your host that as much as you would like to accept the invitation, you must send your regrets due to your visitors, but to please think of you again in the future. Only if your host, in turn, then suggests that you may bring your guest to the party is it correct to do so. It would not be out of line for you to offer to cover the costs for your additional guest. 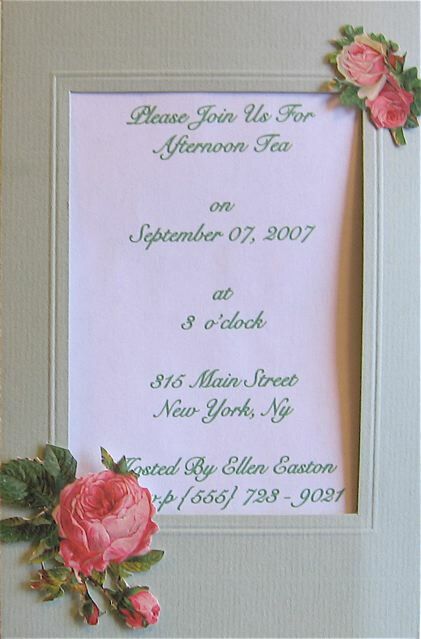 (2) All invitations require a R.S.V.P. If the invitation requires a written response, do so in a timely manner. Do not leave your host guessing, be courteous and reply. Do inform your host, at the time of your R.S.V.P., of any food allergies that you may have. This will allow your host to accommodate your menu needs without being caught off guard. However, do not expect your host to change the entire menu on your behalf. Never impose on your host. Either accept the invitation as is or respectfully send your regrets. If you have not sent a R.S.V.P, certainly do not plan on just showing up. If you have accepted, mark your calendar and be certain to attend. Once you have accepted an invitation, if for any reason you are unable to attend, notify your host to cancel. Never be a no show. (3) Do bring a gift to your host. One that is appropriate to the occasion to which you have been invited. Do not expect your host to serve or use your gift at the event, as most likely the menu and decor have already been planned in advance. (4) Be a good guest. Engage others in conversation without being controversial. Do not monopolize the conversation. Have good table manners. When one is a guest in a public establishment, do not order the most expensive items on the menu. Do not order extra food items from the menu. Never take it upon yourself to order any alcoholic beverages by the bottle. Only your host has the right to order alcohol by the bottle. A good guest will never consume more than two alcoholic beverages at any one event. Do call the next day to thank your host. If you can afford to do so, by all means send a bouquet of flowers as well. A hand-written thank you note, once the tradition, is now a welcome touch. Remember – A considerate and good guest will always be invited back!